The following testimony took place between 2:00 P.M. and 2:26 P.M. on 1/16/09. Ben Sanders, a guidance counselor at Mount Vernon Middle School, testified that he had the “Colin Powell/Bush” poster in the office in which he counsels students. Sanders had his copy of the poster behind his office door such that it was visible inside the room when the door was closed. It was visible to students that were in the room for counseling. Being a guidance counselor means helping students that are dealing with personal problems such as problems with friends and parents, Sanders said. Sanders described that year as one in which the school was short on people. It was also Sanders’ first year working at the middle school. Sanders commented that a person can “minister” through their actions, it does not necessarily require speaking. The back of the poster was photocopied by the hearing official and entered as an exhibit. Neither the cross nor the poster is kept in Sanders’ office now. Assistant principal Brad Ritchey recently asked for them to be removed, Sanders said. Ritchey talked with Sanders two times about the cross—the first time to tell him that he might need to remove it, and then the second time asked him to remove the cross and the poster, Sanders said. Sanders said he has heard about inspections (for religious items) being done in classrooms, but has not seen them doing it. Part of Sanders’ job responsibilities is to check classrooms before tests are given to make sure that there is nothing being displayed that might give students answers to test materials, Sanders said. He has pulled some items while doing this task and as he understands it, he does have the authority to do this. Administration can remove things from classrooms because it is the school, not the teacher’s personal space, Sanders said. Hamilton asked Sanders if there are any places in the classroom that are off limits to the students. Sanders replied that students are not supposed to go behind the teacher’s desk—this is a teacher rule to respect this space, not a school rule. Sanders said that he has been in most, if not all, of the classrooms at the school and has seen religious items such as a cross, angel, saint and an American flag which had the words “In God we trust.” He did not give these things much thought until the recent controversy came up. Sanders never saw Freshwater teaching or preaching from the Bible, but Sanders never spent a lengthy amount of time in Freshwater’s classroom. Four years ago, his daughter was in Freshwater’s class and was involved with Fellowship of Christian Athletes (FCA)—she never had any complaints about Freshwater, Sanders said. 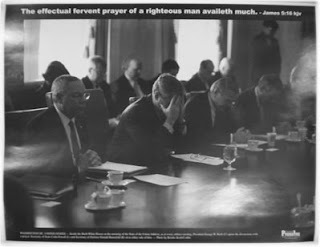 Sanders was not interviewed by HR On Call, Inc.
"The poster shows Colin Powell and President Bush in prayer. Written at the top of the poster is a portion of James 5:16: “The effectual fervent prayer of a righteous man availeth much.” (A witness earlier in the day, Brian Gastin, said the poster came out following the 911 attacks.)" "The photograph was taken January 28, 2003. © Brooks Kraft/CORBIS. The poster was printed by Freeport Press, Inc.)"